Winter green salad! 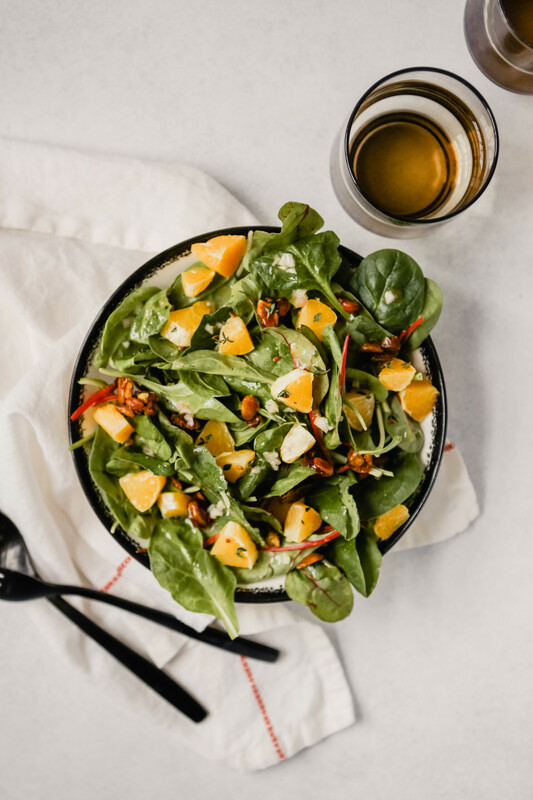 A mix of hardy flavorful winter greens, juicy oranges, candied pistachios, fresh thyme and an incredibly easy honey-Dijon vinaigrette. Winter at its finest. This salad truly is a dump, toss and serve kind of side dish. It’s also incredibly versatile—winner all around. 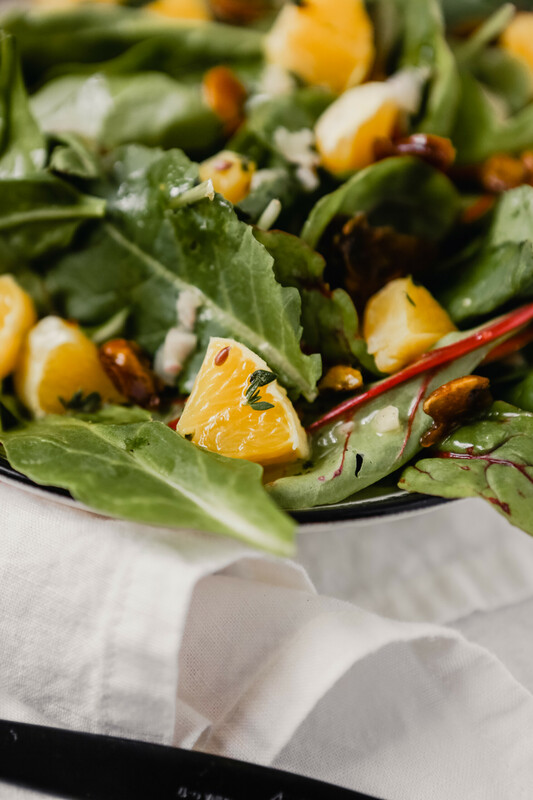 In the same vein as the classic summer salad made with almonds, strawberries and a poppy seed vinaigrette, this winter green salad turns to in-season citrus, herbs, spiced candied nuts, and a homemade vinaigrette to create the perfect winter salad. Here’s what we’ve got going on and how you can modify to make it work for you! Use whatever greens you have on hand; kale, romaine, red leaf, etc. Grapefruit, clementines or kumquats would all be great options as well. Any candied or roasted and salted nut works just as well here. Use whatever fresh herbs you have on hand! Rosemary, oregano, basil, etc., just about any herb will be delicious! Make the most of citrus season! Did you know you can freeze oranges?! 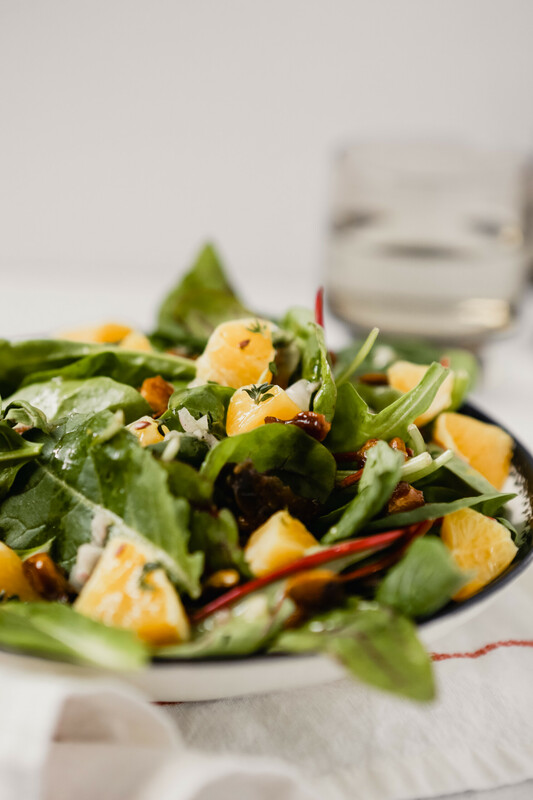 That’s right, the oranges you see in this salad were previously frozen. I peeled, segmented and froze this orange at peak ripeness and you would’ve never known! Check out my step-by-step tutorial (and video) on how to freeze oranges today! 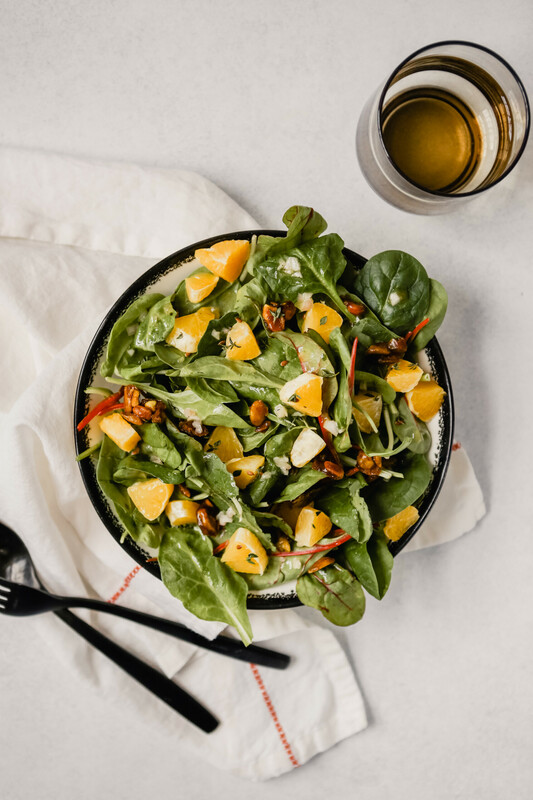 Fresh and flavorful, this winter green salad is packed with flavors and textures from oranges, candied pistachios, fresh thyme and a simple vinaigrette. Coat a small baking sheet with nonstick spray; set aside. Combine sugar, water, salt, and cinnamon in a nonstick skillet over medium heat; cook until sugar dissolves and mixture is bubbling, 1–2 minutes. Add pistachios and cook, stirring to coat the pistachios, until nuts are coated and syrup has thickened and reduced, about 3 minutes. Immediately spread pistachios in an even layer on prepared baking sheet; let cool completely then break into bite sized pieces. Whisk together oil, vinegar, shallot, Dijon, and honey; season with salt and pepper. 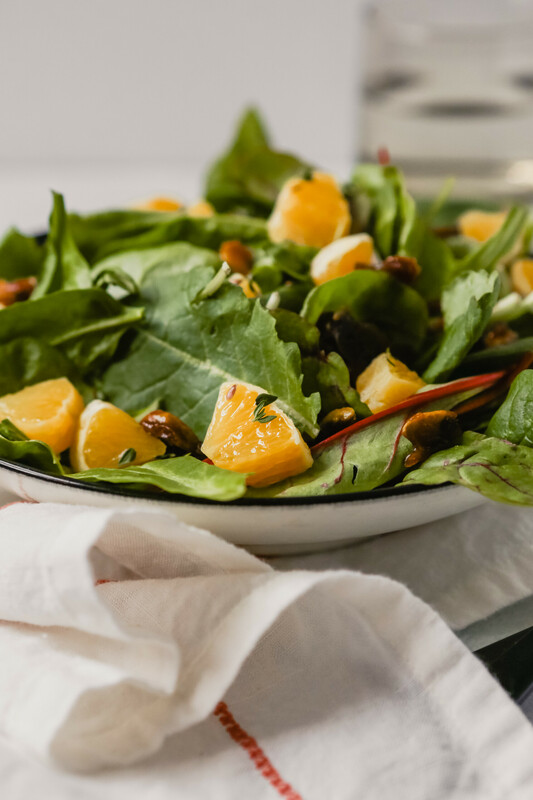 Toss salad greens, orange, and ¼ cup candied pistachios together in a serving bowl, drizzle with vinaigrette and serve. Make the candies pistachios up to 1 week ahead of time! Or, if you’d rather use roasted and salted, go right ahead! 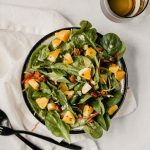 Make the vinaigrette up to 3 days ahead of time and store in the refrigerator. Let vinaigrette sit out at room temperature 15 minutes prior to serving to allow oil to liquefy.